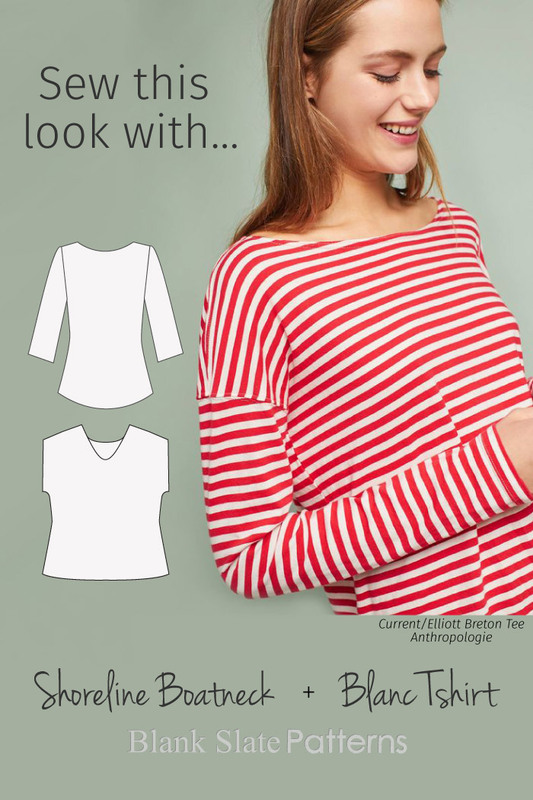 First, lay your Shoreline Boatneck front piece (red) over your Blanc T-shirt front piece (blue) as shown above. The center front fold line for both pieces should be aligned, and the outside of the Shoreline shoulder edge should meet the shoulder edge for the Blanc. The majority of your pattern will be Blanc (blue), but with the Shoreline neckline and shoulder (in red). Keeping the Shoreline neckline together with the shoulder angle is important for the neckline to lie flat. Your finished front piece will look something like the above. Remember to repeat these steps on the back piece. When constructing, use the Shoreline neck facing pieces and the long sleeves from the Blanc Hack Pack.